Hang En translates to “swift” and the cave is named after the millions of birds who call it home. Local ethnic minorities have used the cave for centuries, both as a shelter from storms and as a hunting ground — baby swifts are a local delicacy. The cave was “discovered” by British explorers in 1994 and has only recently become accessible to visitors. Hang En was carved from the limestone of the Annamite Mountains 3 million years ago by the Rao Thuong River, which each rainy season still swells to make the cave a little larger every year. Full Disclosure: Oxalis Adventure Tours let me hop onto their two-day, one night Hang En Adventure Tour for free. I was part of a typical commercial trip with 15 other guests. Oxalis picked me up from Jungle Boss Homestay at 8am; from there we drove to their headquarters to go over the Hang En Adventure Tour’s itinerary, safety briefing, and gear check before venturing out into the jungle. The Mountain Hardwear WickedCool T lived up to its name in the hot, humid jungle, keeping me cool and dry. Once our group was ready to go, we all hopped into a big tour bus and began the hour-long ride to the trailhead. The hike to Hang En was about six miles long, but we stopped for lunch and then visited the Ban Doong minority village on the way. The hike led us down a steep mountain before dropping our group into the valley below. From there we crossed a series of rivers and streams a dozen or so times before reaching the smallest, but most accessible entrance to Hang En. We followed the same river into Hang En and climbed up a mountain of boulders before being rewarded with our first glance of the main cavern. From our vantage point, located midway up the larger entrance, we could see the entire expanse of Hang En’s first chamber. The space was so unfathomably massive; tents looked like jellybeans down below. I scrambled up the boulder-strewn wall to find this perspective from the cave’s ceiling. Once we had a chance to fully indulge in our elevated perspective, we hiked down the rest of the way to camp and claimed our beach front real estate for the night. Upon settling in, we scrambled up to another viewpoint, located to the side of the main cavern. The view from up there was even more impressive, as Hang En’s main entrance dominated the background. The Vasque Lotic performance water shoes are great for transitioning between water, dirt, and mud. They drain quickly while providing good traction on all slippery surfaces. Afterward we swam in the turquoise pools formed by the river, then feasted on an all-you-can-eat Vietnamese BBQ buffet. I ghosted early, returning to my tent to bask in peaceful solitude at this otherworldly place. The next morning we feasted on chocolate and banana pancakes, mangoes, and spring rolls before venturing deeper into Hang En. I felt like I was in the underground world from Prometheus. The further we went, the more alien our new world became. Slivers of light reflected off of the river, silhouetting the shape of each body passing through. Rock formations sprouted from the ground, their patterns eerily symmetrical in nature. The air vibrated with sounds of ten thousand swifts dancing above. Hang En knows how to make an exit. Hang En’s exit was more stunning than its entrance. The river flowed outward as the jungle crept in through the opening, which was more than 300 feet high. The swifts that we heard earlier were finally visible; their black bodies blotted out the sky. Imaginations captured, we hiked out of the jungle; back to our ride. Touring Hang En Cave was truly an otherworldly experience. Its scale was gargantuan; I’ve never witnessed such an enormous enclosed space. Oxalis, which is the only outfitter that runs tours into the cave, has also worked with local authorities to maintain Hang En’s wilderness. This adventure did not feel touristy, like so many other activities found in Vietnam. The Cotopaxi Volta 35L rolltop pack is constructed from water resistant canvas and its padded shoulder straps and back panel create enough airflow that its comfortable to wear in even hot, humid jungle conditions. That, plus its understated casual looks make it equally at home in the airport or out on the trail. A small daypack will be enough to carry all your stuff for this adventure. My go-to pack for traveling Asia was a 35L Cotopaxi. Oxalis provided canvas boots for hiking if you need ‘em, but my Vasque Lotic amphibious shoes worked great for transitioning between trail and water, both in the cave and through the numerous water crossings. Oxalis also provided large dry bags, but if you plan on carrying a camera, it would be a good idea to bring along a backup for extra protection. I prefer the SealLine Nimbus for their light weight and durability. Bring an extra set of clothes, and a swimsuit. The hike is pretty exposed, so sunglasses and a hat will be helpful too. “Welcome to the jungle...” and “Get your motor running...” both apply. Hang En Cave Adventure Tours originate in Phong Nha, Vietnam. Oxalis has a really helpful arrival and departure guide on their site. Check it out. If you’re adventurous, you could ride a $450 motorcycle there like I did. I made a new friend on the hike out. The resemblance is striking. Anyone with a moderate fitness level should be able to enjoy this adventure. The hike was approximately six miles each way/per day; included some elevation gain and loss at the beginning and end. No technical experience was needed to explore inside Hang En. The minimum age is 16. Phong Nha was one of the most scenic villages I’ve ever seen. Without a doubt, you should stay with the Phong Nha Homestay Community. The community was established by Dzung Le, owner of Jungle Boss Homestay, in order to provide economic development opportunities for local people which, until recently, were residents of one of the poorest districts in Vietnam. Tourism is exploding in Phong Nha; in just three months, the picturesque village has experienced more than a one-hundred percent increase over 2014. As such, many developers are trying to gain footing, but the homestay community has provided support for locals who would like to develop their own homestays instead of selling their property to developers. Additionally, the community is committed to providing authentic, local experiences for tourists. I stayed at Jungle Boss Homestay throughout my time in Phong Nha. The rooms were simple and modern, but full of traditional Vietnamese charm. I took dinner every night with Le’s family; the experience was extraordinary. Coming in hot! Ziplining was a great way to kick off the Dark Cave adventure. Phong Nha is known for its caves; there are several to explore. 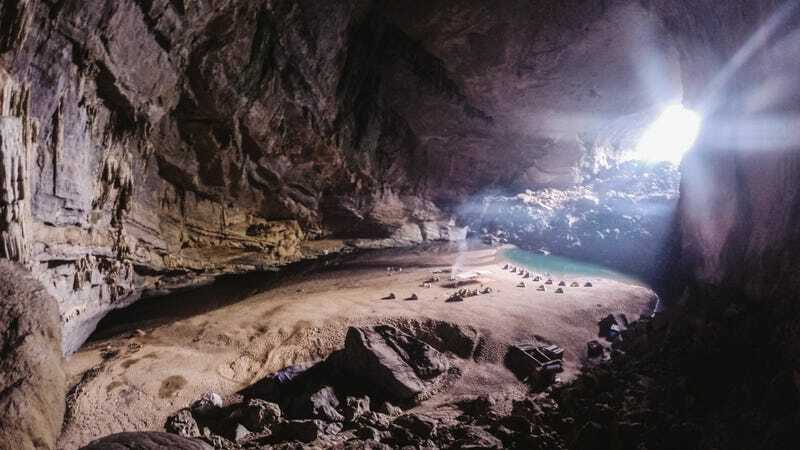 In addition to Hang En, Oxalis offers tours of Son Doong — the largest cave in the world, as well as Tu Lan Cave — which is defined by the rivers running through it. After exploring Hang En, I jumped on a Dark Cave tour with ABS Travel, which included ziplining across a river, exploring the cave; floating in its mud bath, kayaking, and swimming. Photos: Chris “I lost my camera in Vietnam and now all I have is a GoPro” Brinlee, Jr.